A persistent vegetative state (PVS) is a disorder of consciousness in which patients with severe brain damage are in a state of partial arousal rather than true awareness. After four weeks in a vegetative state (VS), the patient is classified as in a persistent vegetative state. This diagnosis is classified as a permanent vegetative state some months (3 in the US and 6 in the UK) after a non-traumatic brain injury or one year after a traumatic injury. Nowadays, more doctors and neuroscientists prefer to call the state of consciousness a syndrome, primarily because of ethical questions about whether a patient can be called "vegetative" or not. There are several definitions that vary by technical versus layman's usage. There are different legal implications in different countries. A wakeful unconscious state that lasts longer than a few weeks is referred to as a persistent (or 'continuing') vegetative state. Unlike brain death, permanent vegetative state (PVS) is recognized by statute law as death in very few legal systems. In the US, courts have required petitions before termination of life support that demonstrate that any recovery of cognitive functions above a vegetative state is assessed as impossible by authoritative medical opinion. In England and Wales the legal precedent for withdrawal of clinically assisted nutrition and hydration in cases of patients in a PVS was set in 1993 in the case of Tony Bland, who sustained catastrophic anoxic brain injury in the 1989 Hillsborough disaster. An application to the Court of Protection is no longer required before nutrition and hydration can be withdrawn or withheld from PVS (or 'minimally conscious' - MCS) patients. This legal grey area has led to vocal advocates that those in PVS should be allowed to die. Others are equally determined that, if recovery is at all possible, care should continue. The existence of a small number of diagnosed PVS cases that have eventually resulted in improvement makes defining recovery as "impossible" particularly difficult in a legal sense. This legal and ethical issue raises questions about autonomy, quality of life, appropriate use of resources, the wishes of family members, and professional responsibilities. The vegetative state is a chronic or long-term condition. This condition differs from a coma: a coma is a state that lacks both awareness and wakefulness. Patients in a vegetative state may have awoken from a coma, but still have not regained awareness. In the vegetative state patients can open their eyelids occasionally and demonstrate sleep-wake cycles, but completely lack cognitive function. The vegetative state is also called a "coma vigil". The chances of regaining awareness diminish considerably as the time spent in the vegetative state increases. Persistent vegetative state is the standard usage (except in the UK) for a medical diagnosis, made after numerous neurological and other tests, that due to extensive and irreversible brain damage a patient is highly unlikely ever to achieve higher functions above a vegetative state. This diagnosis does not mean that a doctor has diagnosed improvement as impossible, but does open the possibility, in the US, for a judicial request to end life support. Informal guidelines hold that this diagnosis can be made after four weeks in a vegetative state. US caselaw has shown that successful petitions for termination have been made after a diagnosis of a persistent vegetative state, although in some cases, such as that of Terri Schiavo, such rulings have generated widespread controversy. In the UK, the term 'persistent vegetative state' is discouraged in favor of two more precisely defined terms that have been strongly recommended by the Royal College of Physicians (RCP). These guidelines recommend using a continuous vegetative state for patients in a vegetative state for more than four weeks. A medical determination of a permanent vegetative state can be made if, after exhaustive testing and a customary 12 months of observation, a medical diagnosis is made that it is impossible by any informed medical expectations that the mental condition will ever improve. Hence, a "continuous vegetative state" in the UK may remain the diagnosis in cases that would be called "persistent" in the US or elsewhere. While the actual testing criteria for a diagnosis of "permanent" in the UK are quite similar to the criteria for a diagnosis of "persistent" in the US, the semantic difference imparts in the UK a legal presumption that is commonly used in court applications for ending life support. The UK diagnosis is generally only made after 12 months of observing a static vegetative state. A diagnosis of a persistent vegetative state in the US usually still requires a petitioner to prove in court that recovery is impossible by informed medical opinion, while in the UK the "permanent" diagnosis already gives the petitioner this presumption and may make the legal process less time-consuming. In common usage, the "permanent" and "persistent" definitions are sometimes conflated and used interchangeably. However, the acronym "PVS" is intended to define a "persistent vegetative state", without necessarily the connotations of permanence, and is used as such throughout this article. Bryan Jennett, who originally coined the term "persistent vegetative state", has now recommended using the UK division between continuous and permanent in his most recent book The Vegetative State. This is only for purposes of precision, on the grounds that "the 'persistent' component of this term ... may seem to suggest irreversibility". The Australian National Health and Medical Research Council has suggested "post coma unresponsiveness" as an alternative term for "vegetative state" in general. Most PVS patients are unresponsive to external stimuli and their conditions are associated with different levels of consciousness. Some level of consciousness means a person can still respond, in varying degrees, to stimulation. A person in a coma, however, cannot. In addition, PVS patients often open their eyes in response to feeding, which has to be done by others; they are capable of swallowing, whereas patients in a coma subsist with their eyes closed (Emmett, 1989). Cerebral cortical function (e.g. communication, thinking, purposeful movement, etc) is lost while brainstem functions (e.g. breathing, maintaining circulation and hemodynamic stability, etc) are preserved. Non-cognitive upper brainstem functions such as eye-opening, occasional vocalizations (e.g. crying, laughing), maintaining normal sleep patterns, and spontaneous non-purposeful movements often remain intact. Individuals in PVS are seldom on any life-sustaining equipment other than a feeding tube because the brainstem, the center of vegetative functions (such as heart rate and rhythm, respiration, and gastrointestinal activity) is relatively intact (Emmett, 1989). Many people emerge spontaneously from a vegetative state within a few weeks. The chances of recovery depend on the extent of injury to the brain and the patient's age – younger patients having a better chance of recovery than older patients. A 1994 report found that of those who were in a vegetative state a month after a trauma, 54% had regained consciousness by a year after the trauma, whereas 28% had died and 18% were still in the vegetative state. But for non-traumatic injuries such as strokes, only 14% had recovered consciousness at one year, 47% had died, and 39% were still vegetative. Patients who were vegetative six months after the initial event were much less likely to have recovered consciousness a year after the event than in the case of those who were simply reported vegetative at one month. 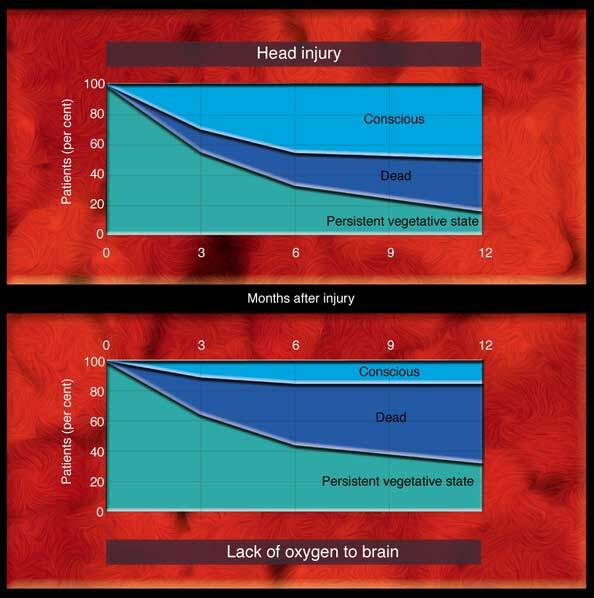 A New Scientist article from 2000 gives a pair of graphs showing changes of patient status during the first 12 months after head injury and after incidents depriving the brain of oxygen. After a year, the chances that a PVS patient will regain consciousness are very low and most patients who do recover consciousness experience significant disability. The longer a patient is in a PVS, the more severe the resulting disabilities are likely to be. Rehabilitation can contribute to recovery, but many patients never progress to the point of being able to take care of themselves. Despite converging agreement about the definition of persistent vegetative state, recent reports have raised concerns about the accuracy of diagnosis in some patients, and the extent to which, in a selection of cases, residual cognitive functions may remain undetected and patients are diagnosed as being in a persistent vegetative state. Objective assessment of residual cognitive function can be extremely difficult as motor responses may be minimal, inconsistent, and difficult to document in many patients, or may be undetectable in others because no cognitive output is possible (Owen et al., 2002). In recent years, a number of studies have demonstrated an important role for functional neuroimaging in the identification of residual cognitive function in persistent vegetative state; this technology is providing new insights into cerebral activity in patients with severe brain damage. Such studies, when successful, may be particularly useful where there is concern about the accuracy of the diagnosis and the possibility that residual cognitive function has remained undetected. Researchers have begun to use functional neuroimaging studies to study implicit cognitive processing in patients with a clinical diagnosis of persistent vegetative state. Activations in response to sensory stimuli with positron emission tomography (PET), functional magnetic resonance imaging (fMRI), and electrophysiological methods can provide information on the presence, degree, and location of any residual brain function. However, use of these techniques in people with severe brain damage is methodologically, clinically, and theoretically complex and needs careful quantitative analysis and interpretation. For example, PET studies have shown the identification of residual cognitive function in persistent vegetative state. That is, an external stimulation, such as a painful stimulus, still activates "primary" sensory cortices in these patients but these areas are functionally disconnected from "higher order" associative areas needed for awareness. These results show that parts of the cortex are indeed still functioning in "vegetative" patients (Matsuda et al., 2003). Furthermore, several studies have used PET to assess the central processing of noxious somatosensory stimuli in patients in PVS. Noxious somatosensory stimulation activated midbrain, contralateral thalamus, and primary somatosensory cortex in each and every PVS patient, even in the absence of detectable cortical evoked potentials. In conclusion, somatosensory stimulation of PVS patients, at intensities that elicited pain in controls, resulted in increased neuronal activity in primary somatosensory cortex, even if resting brain metabolism was severely impaired. However, this activation of primary cortex seems to be isolated and dissociated from higher-order associative cortices (Laureys et al., 2002). Also, there is evidence of partially functional cerebral regions in catastrophically injured brains. To study five patients in PVS with different behavioral features, researchers employed PET, MRI and magnetoencephalographic (MEG) responses to sensory stimulation. In three of the five patients, co-registered PET/MRI correlate areas of relatively preserved brain metabolism with isolated fragments of behavior. Two patients had suffered anoxic injuries and demonstrated marked decreases in overall cerebral metabolism to 30–40% of normal. Two other patients with non-anoxic, multifocal brain injuries demonstrated several isolated brain regions with higher metabolic rates, that ranged up to 50–80% of normal. Nevertheless, their global metabolic rates remained <50% of normal. MEG recordings from three PVS patients provide clear evidence for the absence, abnormality or reduction of evoked responses. Despite major abnormalities, however, these data also provide evidence for localized residual activity at the cortical level. Each patient partially preserved restricted sensory representations, as evidenced by slow evoked magnetic fields and gamma band activity. In two patients, these activations correlate with isolated behavioral patterns and metabolic activity. Remaining active regions identified in the three PVS patients with behavioral fragments appear to consist of segregated corticothalamic networks that retain connectivity and partial functional integrity. A single patient who suffered severe injury to the tegmental mesencephalon and paramedian thalamus showed widely preserved cortical metabolism, and a global average metabolic rate of 65% of normal. The relatively high preservation of cortical metabolism in this patient defines the first functional correlate of clinical– pathological reports associating permanent unconsciousness with structural damage to these regions. The specific patterns of preserved metabolic activity identified in these patients reflect novel evidence of the modular nature of individual functional networks that underlie conscious brain function. The variations in cerebral metabolism in chronic PVS patients indicate that some cerebral regions can retain partial function in catastrophically injured brains (Schiff et al., 2002). Statistical PVS misdiagnosis is common. An example study with 40 patients in the United Kingdom reported 43% of their patients classified as PVS were believed so and another 33% had recovered whilst the study was underway. Some PVS cases may actually be a misdiagnosis of patients being in an undiagnosed minimally conscious state. Since the exact diagnostic criteria of the minimally conscious state were only formulated in 2002, there may be chronic patients diagnosed as PVS before the secondary notion of the minimally conscious state became known. Whether or not there is any conscious awareness with a patient's vegetative state is a prominent issue. Three completely different aspects of this should be distinguished. First, some patients can be conscious simply because they are misdiagnosed (see above). In fact, they are not in vegetative states. Second, sometimes a patient was correctly diagnosed but is then examined during the early stages of recovery. Third, perhaps some day the notion itself of vegetative states will change so to include elements of conscious awareness. Inability to disentangle these three example cases causes confusion. An example of such confusion is the response to a recent experiment using functional magnetic resonance imaging which revealed that a woman diagnosed with PVS was able to activate predictable portions of her brain in response to the tester's requests that she imagine herself playing tennis or moving from room to room in her house. The brain activity in response to these instructions was indistinguishable from those of healthy patients. In 2010, Martin Monti and fellow researchers, working at the MRC Cognition and Brain Sciences Unit at the University of Cambridge, reported in an article in the New England Journal of Medicine that some patients in persistent vegetative states responded to verbal instructions by displaying different patterns of brain activity on fMRI scans. Five out of a total of 54 diagnosed patients were apparently able to respond when instructed to think about one of two different physical activities. One of these five was also able to "answer" yes or no questions, again by imagining one of these two activities. It is unclear, however, whether the fact that portions of the patients' brains light up on fMRI could help these patients assume their own medical decision making. In November 2011, a publication in The Lancet presented bedside EEG apparatus and indicated that its signal could be used to detect awareness in three of 16 patients diagnosed in the vegetative state. Currently no treatment for vegetative state exists that would satisfy the efficacy criteria of evidence-based medicine. Several methods have been proposed which can roughly be subdivided into four categories: pharmacological methods, surgery, physical therapy, and various stimulation techniques. Pharmacological therapy mainly uses activating substances such as tricyclic antidepressants or methylphenidate. Mixed results have been reported using dopaminergic drugs such as amantadine and bromocriptine and stimulants such as dextroamphetamine. Surgical methods such as deep brain stimulation are used less frequently due to the invasiveness of the procedures. Stimulation techniques include sensory stimulation, sensory regulation, music and musicokinetic therapy, social-tactile interaction, and cortical stimulation. There is limited evidence that the hypnotic drug zolpidem has an effect. The results of the few scientific studies that have been published so far on the effectiveness of zolpidem have been contradictory. In the United States, it is estimated that there may be between 15,000 and 40,000 patients who are in a persistent vegetative state, but due to poor nursing home records exact figures are hard to determine. The syndrome was first described in 1940 by Ernst Kretschmer who called it apallic syndrome. The term persistent vegetative state was coined in 1972 by Scottish spinal surgeon Bryan Jennett and American neurologist Fred Plum to describe a syndrome that seemed to have been made possible by medicine's increased capacities to keep patients' bodies alive. An ongoing debate exists as to how much care, if any, patients in a persistent vegetative state should receive in health systems plagued by limited resources. In a case before the New Jersey Superior Court, Betancourt v. Trinitas Hospital, a community hospital sought a ruling that dialysis and CPR for such a patient constitutes futile care. An American bioethicist, Jacob M. Appel, argued that any money spent treating PVS patients would be better spent on other patients with a higher likelihood of recovery. The patient died naturally prior to a decision in the case, resulting in the court finding the issue moot. In 2010, British and Belgian researchers reported in an article in the New England Journal of Medicine that some patients in persistent vegetative states actually had enough consciousness to "answer" yes or no questions on fMRI scans. However, it is unclear whether the fact that portions of the patients' brains light up on fMRI will help these patient assume their own medical decision making. Professor Geraint Rees, Director of the Institute of Cognitive Neuroscience at University College London, responded to the study by observing that, "As a clinician, it would be important to satisfy oneself that the individual that you are communicating with is competent to make those decisions. At the moment it is premature to conclude that the individual able to answer 5 out of 6 yes/no questions is fully conscious like you or I." In contrast, Jacob M. Appel of the Mount Sinai Hospital told the Telegraph that this development could be a welcome step toward clarifying the wishes of such patients. Appel stated: "I see no reason why, if we are truly convinced such patients are communicating, society should not honour their wishes. In fact, as a physician, I think a compelling case can be made that doctors have an ethical obligation to assist such patients by removing treatment. I suspect that, if such individuals are indeed trapped in their bodies, they may be living in great torment and will request to have their care terminated or even active euthanasia." ^ Laureys, Steven; Celesia, Gastone G; Cohadon, Francois; Lavrijsen, Jan; León-Carrión, José; Sannita, Walter G; Sazbon, Leon; Schmutzhard, Erich; von Wild, Klaus R (2010-11-01). "Unresponsive wakefulness syndrome: a new name for the vegetative state or apallic syndrome". BMC Medicine. 8: 68. doi:10.1186/1741-7015-8-68. ISSN 1741-7015. PMC 2987895. PMID 21040571. ^ Laureys S, Celesia GG, Cohadon F, Lavrijsen J, León-Carrión J, Sannita WG, Sazbon L, Schmutzhard E, von Wild KR, Zeman A, Dolce G (2010). "Unresponsive wakefulness syndrome: a new name for the vegetative state or apallic syndrome". BMC Med. 8: 68. doi:10.1186/1741-7015-8-68. PMC 2987895. PMID 21040571. ^ Jennett, B (1999). "Should cases of permanent vegetative state still go to court?. Britain should follow other countries and keep the courts for cases of dispute". BMJ (Clinical Research Ed.). 319 (7213): 796–97. doi:10.1136/bmj.319.7213.796. PMC 1116645. PMID 10496803. ^ PVS, The Multi-Society Task Force on (1994-05-26). "Medical Aspects of the Persistent Vegetative State". New England Journal of Medicine. 330 (21): 1499–1508. doi:10.1056/NEJM199405263302107. ISSN 0028-4793. PMID 7818633. ^ a b Wade, DT; Johnston, C (1999). "The permanent vegetative state: Practical guidance on diagnosis and management". BMJ (Clinical Research Ed.). 319 (7213): 841–4. doi:10.1136/bmj.319.7213.841. PMC 1116668. PMID 10496834. ^ Guidance on diagnosis and management: Report of a working party of the Royal College of Physicians. Royal College of Physicians: London. 1996. ^ a b c Bryan Jennett. The Vegetative State: Medical facts, ethical and legal dilemmas (PDF). University of Glasgow: Scotland. Retrieved 2007-11-09. ^ Post-coma unresponsiveness (Vegetative State): a clinical framework for diagnosis. National Health and Medical Research Council (NHMRC): Canberra. 2003. Archived from the original on 2006-08-20. ^ Jennett, B (2002). "Editorial: The vegetative state. The definition, diagnosis, prognosis and pathology of this state are discussed, together with the legal implications". British Medical Journal. 73 (4): 355–357. doi:10.1136/jnnp.73.4.355. PMC 1738081. PMID 12235296. Retrieved 2012-06-11. ^ Nell Boyce (July 8, 2000). "Is anyone in there?". New Scientist: 36. ^ Schapira, Anthony (December 18, 2006). Neurology and Clinical Neuroscience. Mosby. p. 126. ISBN 978-0323033541. ^ Mirsattari SM, Hammond RR, Sharpe MD, Leung FY, Young GB (April 2004). "Myoclonic status epilepticus following repeated oral ingestion of colloidal silver". Neurology. 62 (8): 1408–10. doi:10.1212/01.WNL.0000120671.73335.EC. PMID 15111684. ^ K Andrews; L Murphy; R Munday; C Littlewood (1996-07-06). "Misdiagnosis of the vegetative state: retrospective study in a rehabilitation unit". British Medical Journal. 313 (7048): 13–16. doi:10.1136/bmj.313.7048.13. PMC 2351462. PMID 8664760. ^ Giacino JT, et al. (2002). "Unknown title". Neurology. 58 (3): 349–353. doi:10.1212/wnl.58.3.349. PMID 11839831. ^ Owen AM, Coleman MR, Boly M, Davis MH, Laureys S, Pickard JD (2006-09-08). "Detecting awareness in the vegetative state". Science. 313 (5792): 1402. CiteSeerX 10.1.1.1022.2193. doi:10.1126/science.1130197. PMID 16959998. ^ "Vegetative patient 'communicates': A patient in a vegetative state can communicate just through using her thoughts, according to research". BBC News. September 7, 2006. Retrieved 2008-08-14. ^ Stein R (September 8, 2006). "Vegetative patient's brain active in test: Unprecedented experiment shows response to instructions to imagine playing tennis". San Francisco Chronicle. Retrieved 2007-09-26. ^ Cruse Damian; et al. (2011). "Bedside detection of awareness in the vegetative state: a cohort study". The Lancet. 378 (9809): 2088–2094. CiteSeerX 10.1.1.368.3928. doi:10.1016/S0140-6736(11)61224-5. PMID 22078855. ^ Dolce, Giuliano; Sazbon, Leon (2002). The post-traumatic vegetative state. ISBN 9781588901163. ^ Georgiopoulos M, et al. (2010). "Vegetative state and minimally conscious state: a review of the therapeutic interventions". Stereotact Funct Neurosurg. 88 (4): 199–207. doi:10.1159/000314354. PMID 20460949. ^ Snyman, N; Egan, JR; London, K; Howman-Giles, R; Gill, D; Gillis, J; Scheinberg, A (2010). "Zolpidem for persistent vegetative state--a placebo-controlled trial in pediatrics". Neuropediatrics. 41 (5): 223–227. doi:10.1055/s-0030-1269893. PMID 21210338. ^ Whyte, J; Myers, R (2009). "Incidence of clinically significant responses to zolpidem among patients with disorders of consciousness: a preliminary placebo controlled trial". Am J Phys Med Rehabil. 88 (5): 410–418. doi:10.1097/PHM.0b013e3181a0e3a0. PMID 19620954. ^ Hirsch, Joy (2005-05-02). "Raising consciousness". The Journal of Clinical Investigation. 115 (5): 1102. doi:10.1172/JCI25320. PMC 1087197. PMID 15864333. ^ Ernst Kretschmer (1940). "Das apallische Syndrom". Neurol. Psychiat. 169: 576–579. doi:10.1007/BF02871384. ^ B Jennett; F Plum (1972). "Persistent vegetative state after brain damage: A syndrome in search of a name". The Lancet. 1 (7753): 734–737. doi:10.1016/S0140-6736(72)90242-5. PMID 4111204. Sarà, M.; Sacco, S.; Cipolla, F.; Onorati, P.; Scoppetta, C; Albertini, G; Carolei, A (2007). "An unexpected recovery from permanent vegetative state". Brain Injury. 21 (1): 101–103. doi:10.1080/02699050601151761. PMID 17364525. Canavero S, et al. (2009). "Recovery of consciousness following bifocal extradural cortical stimulation in a permanently vegetative patient". Journal of Neurology. 256 (5): 834–6. doi:10.1007/s00415-009-5019-4. PMID 19252808. Canavero S, Massa-Micon B, Cauda F, Montanaro E (May 2009). "Bifocal extradural cortical stimulation-induced recovery of consciousness in the permanent post-traumatic vegetative state". J Neurol. 256 (5): 834–6. doi:10.1007/s00415-009-5019-4. PMID 19252808. Machado, Calixto, et al. A Cuban Perspective on Management of Persistent Vegetative State. MEDICC Review 2012;14(1):44–48.